At The Culinary Institute of America, we are firm believers that fresh food is the best food. But as the holidays creep up around us, freshly prepared food becomes less of a rule and more of a fantasy. Thoughtful, time-consuming dinners are the first thing to go when time is at a premium, and we find ourselves leaning on takeout and convenience foods. And that’s just leading up to the holidays when we’re dodging cocktail parties and recitals. What about those dinners we’re hosting? The best thing you can do for yourself is to start planning your holiday menu early, making sure it includes plenty of make-ahead items. Have a week of dinners to use up everything in your freezer, then start loading it up with soups, stocks, appetizers, and pies. When the time comes, you can pull things out to defrost, and then you’re just doing a lot of reheating and a little bit of day-of assembly. By now, you’re probably mentally going down your list trying to decide what you can start knocking out. But you might not have all the information you need, so check out this recipe for parsnip-potato latkes served with rhubarb jam before you make any decisions. A perfect twist on the Hanukkah favorites, these latkes will be a hit on your dinner table or as a small bite at a cocktail party (make them mini). Though we don’t usually think of fried foods as a good make-ahead item, they reheat really well. Cook the latkes all the way, then freeze in one layer on a baking sheet. Once they’re frozen, you can transfer them to a zip-top bag. On the day of, bake the latkes from frozen in a hot oven, about 400 degrees, until they’re nice and crispy again. Though we love the traditional combination of potato pancake and applesauce, we experimented with some new flavors, and this one stood out. “The parsnips add a touch of sweetness and complexity that sets these apart from the typical latke,” Culinary Institute chef Bruce Mattel said. If you don’t use parsnips much, this is a great place to start. You can use them just like a carrot, but they have a unique peppery flavor that stands out against the potato. We’re crazy about the pairing with tart rhubarb, cooked with sugar, orange juice, and rosemary until it is thick and jammy. We took a few pieces out for garnish before it got too soft, but you can skip that step to keep it simple. You can freeze the cooked rhubarb in a small container or zip-top bag, and then just defrost it in the refrigerator the day before you use it. Then, reheat it if you’d like or serve it at room temperature. Fall and winter aren’t rhubarb seasons, but you may be able to find some at your local grocery store. If not, you can use frozen, or substitute pear, quince or cranberries. 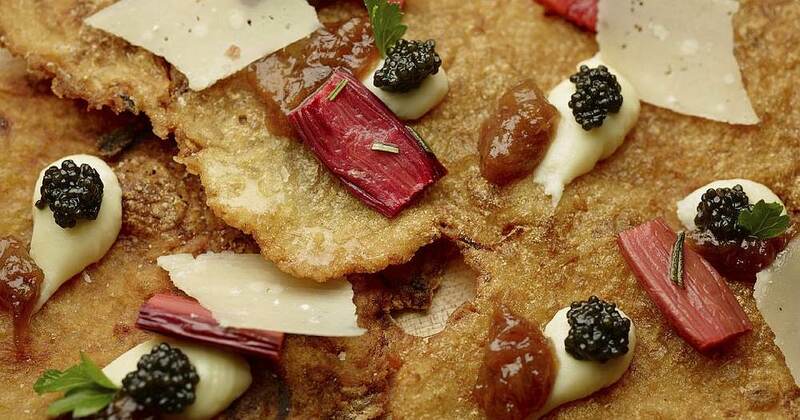 We like the latkes topped with sour cream and a little bit of caviar, too. If you’ll be serving them for Hanukkah, Mattel suggests Brooklyn-based Black Diamond caviar, made from a non-endangered kosher fish. If your latkes don’t make it to the holiday, though, we won’t blame you. They also make the perfect emergency weeknight dinner — way better than takeout! In a medium bowl, combine the parsnips, potatoes, onion and salt. Let rest for about 5 minutes. Squeeze the mixture by the handful over the sink (or in a fine-mesh sieve) to remove any excess liquid. Add the garlic, pepper and tapioca starch, and stir to coat. Form the parsnip mixture into thin patties, about 1/4 cup per latke, squeezing out any additional moisture as you go. Transfer to a parchment-lined baking sheet when done. Heat about 1/4 inch of vegetable oil in a large skillet over medium heat. Transfer the latkes to the pan, working in batches as needed, and fry until golden brown on both sides, about 3 minutes per side. Transfer to a towel-lined tray or rack set over a baking sheet to drain before serving. Serve with rhubarb jam, sour cream and caviar, if desired. Nutrition information per serving of latke: 217 calories; 63 calories from fat; 7 g fat (1 g saturated, 0 g trans fats); 0 mg cholesterol; 332 mg sodium; 38 g carbohydrate; 5 g fiber; 5 g sugar; 3 g protein. Use a vegetable peeler to peel 3 wide strips of zest from the orange, and then juice the orange. Transfer the zest and juice to a medium saucepan. Add the rhubarb, rosemary, sugar and water, and bring to a simmer over medium heat. Simmer, stirring occasionally, until the rhubarb is soft, about 10 minutes. If desired, remove about half of the rhubarb to use as garnish, and set aside. Continue cooking the remaining rhubarb, using the back of a wooden spoon to mash the fruit, until it is soft, thick and jammy, about 20 minutes. Set aside to cool to room temperature before serving. Nutrition information per serving: 169 calories, 3 calories from fat, 0 g fat, 0 mg cholesterol, 7 mg sodium; 42 g carbohydrate, 3 g fiber, 36 g sugar, 1 g protein.